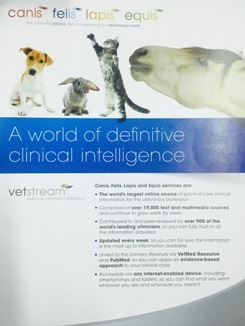 Vetstream Clinical references are online veterinary clinical reference sources, available to veterinary staff via quarterly or annual subscription and accessible from any internet-enabled device. Dr. G Mark Johnston, Managing Director of Vetstream Co. Ltd visited Dr. Achariya Sailasuta, FAVA Secretary General at the Faculty’s library and Information cente, Faculty of Veterinary Science, Chulalongkorn University on 14 May, 2015. 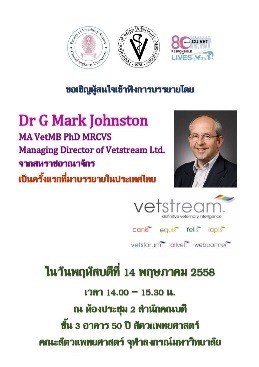 Vetstream collaborating with FAVA contributed the online Clinical reference for teaching the veterinary students in ASEAN countries for one year; Thailand; Faculty of Veterinary Science, Chulalongkorn University and Faculty of Veterinary Medicine, Chiangmai University, Cambodia and Vietnam.